An agreed statement produced by the official commission for dialogue between the Roman Catholic and Anglican churches has been heralded as “ground-breaking” and an “important step on the pilgrimage towards fuller unity in Christ”. 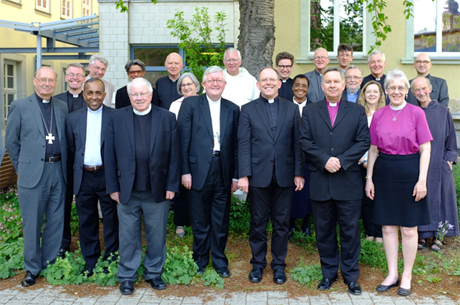 The text for the work – “Walking Together on the Way: Learning to be the Church – Local, Regional, Universal” – was agreed at a meeting of the third phase of the Anglican-Roman Catholic International Commission (ARCIC III) in the German city of Erfurt in May 2017. It was the first document produced by ARCIC III and is the culmination of seven years’ work. The document encourages Anglicans and Roman Catholics to learn from each other’s differences, rather than concentrating on common ground. For example, Anglicans are invited to examine models of unity within the Catholic tradition and Catholics to look at empowering local church leaders and the laity in decision-making. One commission member, the theologian Dr Paula Gooder, called the document ground-breaking. The dialogue’s Anglican Co-Secretary, Dr John Gibaut, stressed the significance of the work and its timeliness. “This document is a remarkable fruit of the high-level doctrinal consensus and real-but-imperfect communion which already exists between the Anglican Communion and the Roman Catholic Church,” he said. “In both method and content, this agreed statement formally commends a new chapter of conscious mutual ecclesial learning, and encourages both communions to receive the gifts of the Holy Spirit from one another. The document will be published later this year. ARCIC III’s next discussions will examine the discernment of right ethical teaching.